Hey everyone…another great party trio. This is really fun to serve all of them, at once. Each one has a unique flavor and all are top notch flavors. I have to admit my favorite was the Buffalo Wing, it’s also the spiciest. I served these with plain Kettle Style chips, they were the perfect vehicle for delivering the yumminess. 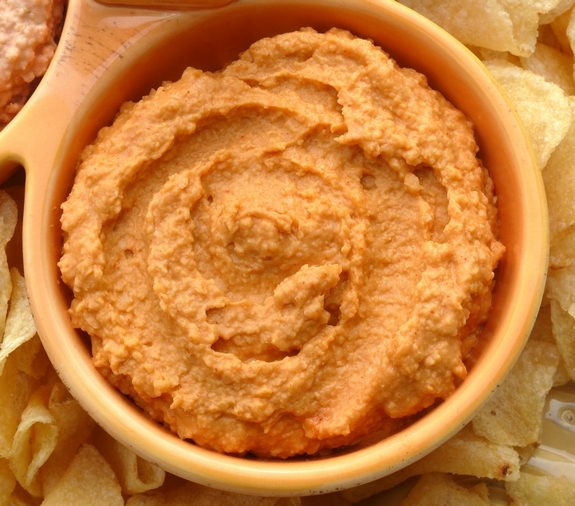 And by incorporating your favorite fatty foods in hummus, there is no reason to deprive yourself (2 Tablespoons average about 40 calories). I love it. Apparently there is a restaurant in Baltimore (The Desert Cafe) that has a rotating menu of a 175 versions of hummus…even sushi and banana-split flavors. They even ship their hummus nationwide. 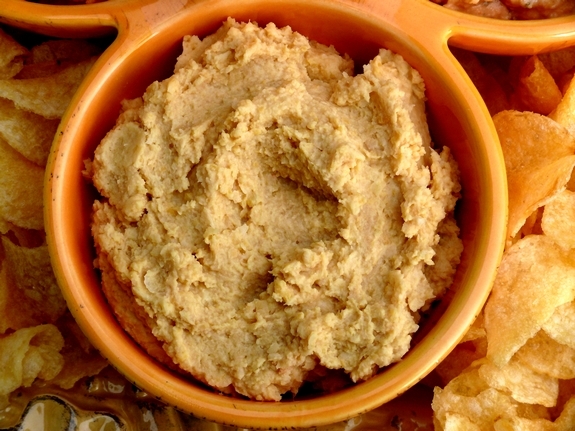 Put chickpeas, chickpea liquid, garlic, tahini, lemon juice, dried onion, onion powder, granulated garlic and salt in a food processor. Puree until smooth and creamy. Put chickpeas, chickpea liquid, garlic, tahini, lemon juice, paprika, Buffalo sauce, hot sauce, vinegar and salt in a food processor. Puree until smooth and creamy. *The original recipe called for 2 Tablespoons barbecue sauce. I just couldn’t imagine how this would have the Buffalo Wing taste using that. So, I used Frank’s Buffalo Wing Sauce…it’s in the condiment aisle. It tasted fantastic. I love hummus! Thanks for sharing some yummy new recipes! Holy, I need to try all of these! They sound lovely! sour cream and onion recipe..mmmmm so how much sour cream? you didn’t put include that in the recipe. i take something every friday to school (im a teaching assistant at a high school) and just discovered hummus!!! i know i know where have i been all this time to never have hummus. makes me think of the cat in the hat story…i would eat hummus here, or there i would eat it anywhere….thanks for all your awesome recipes!!! your nutella tart has become a staple in our house for all occasions. There is no sour cream in this recipe, which is why it’s not fattening. The recipe is titled “Sour Cream and Onion Hummus”. I was wondering why there was no sour cream listed in the ingredients, but was also wondering how a recipe with sour cream could be low fat lol. Well, there is also no “pizza” in the pizza flavored version…these flavors are to simulate the taste only. Does that makes sense? Holy crap those dips look amazing! I am so excited! I have a milk allergy and usually have to pass on the dip at parties, even my own. These look fantastic and I can eat all three! I’m going to make them for my book club next week! Thank you! 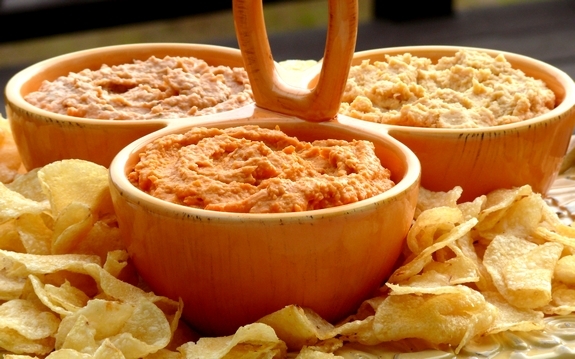 I love homemade hummus and all three of these sound wonderful! Hope all is well in your world Cathy. I’m with you, it has to have Franks Buffalo Wing Sauce! 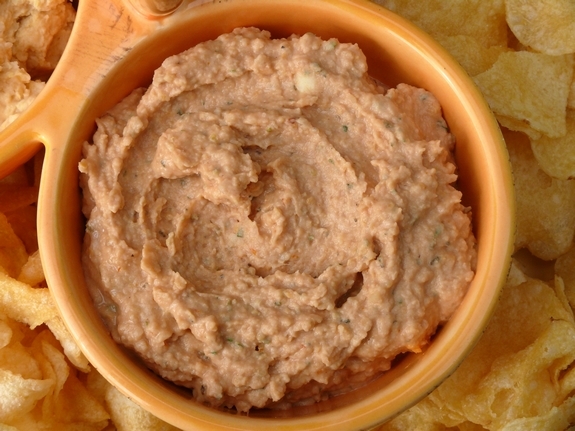 As soon as I can get me some, I’m making this dip! Oh, I love these versions….especially the buffalo chicken on – and I may even get Grumpy to eat hummus this way! I don’t see any sour cream in the sour cream and onion hummus recipe. There is no sour cream, the flavors just mimic the taste. Hi, I don’t see the sour cream included in the sour cream and onion hummus. Is it an oversight? Thanks. No sour cream in this recipe.